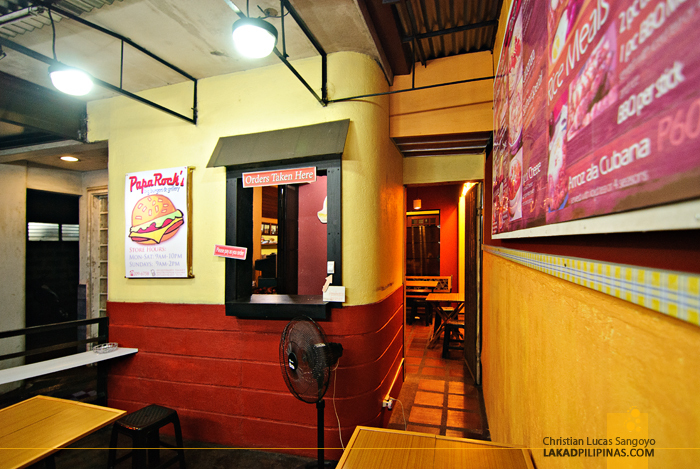 METRO MANILA | Papa Rock’s Burger in Marikina, Rocks! "Go straight through. Turn right here. Aw shucks, one way!” So went our conversation inside the car as we wended our way through the silent streets of Marikina City. We’re not particularly familiar with the ins and outs of this city but we just have to check a burger joint that a friend recommended. ”Excellent burgers,” he said. ”And you just won’t believe how much everything costs!” So off we went to the Shoe Capital of the Philippines, our heads craning out, looking for Papa Rock’s Burgers & Grillery. 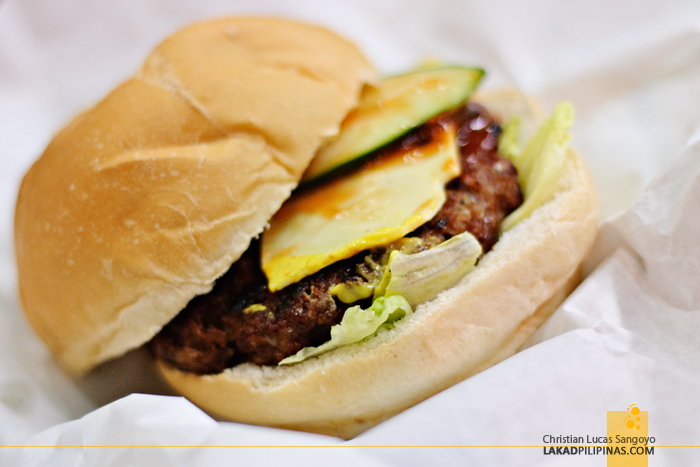 This particular burger joint, it turns out, is located not along the main arteries of Marikina but in a quiet subdivision somewhere at the back of the city’s Sports Complex. After a few wrong turns, we eventually found it sitting snugly alongside village houses on a suburban setting. We were the only customers that night, which was a good thing, since Papa Rock’s seating capacity looks a bit limited. 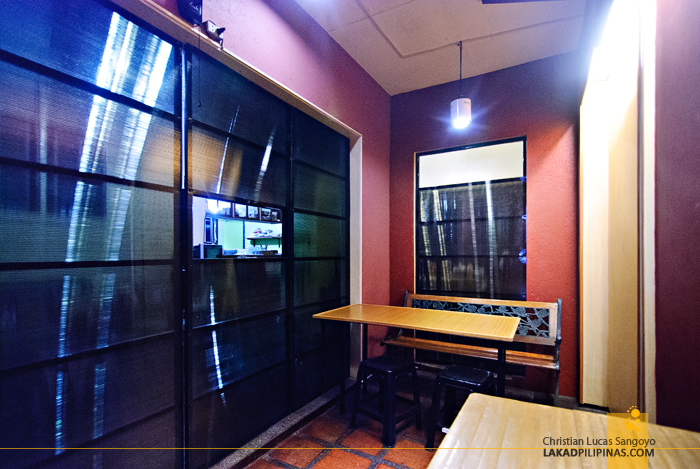 Originally conceptualized as a take-away burger place, it eventually expanded to include dine-in customers. Outside seats soon mushroomed into the yard and eventually snaked its way inside the house—it is indeed a house before it started selling burgers. I think it comfortably seat at least twenty persons. My friend wasn’t exaggerating when he told me how affordable it was at Papa Rock’s. 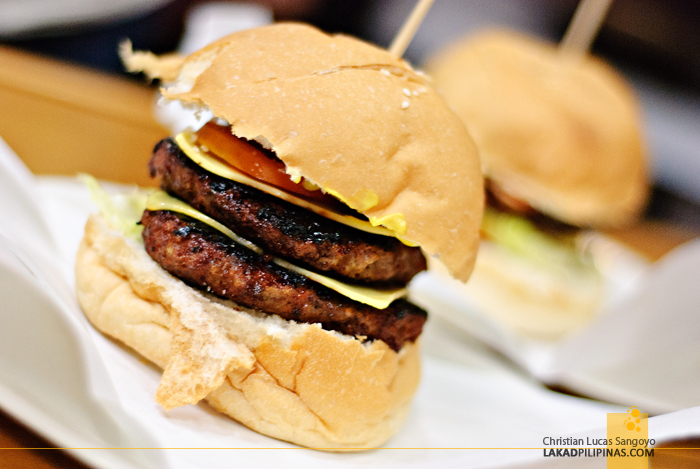 Flame-grilled burgers as low as PHP85.00, pasta offerings at PHP50.00, and pancakes at PHP30.00! Not bad, right? Considering how good the food is, well at least he says it’s good. So we went ahead and tried it for ourselves. 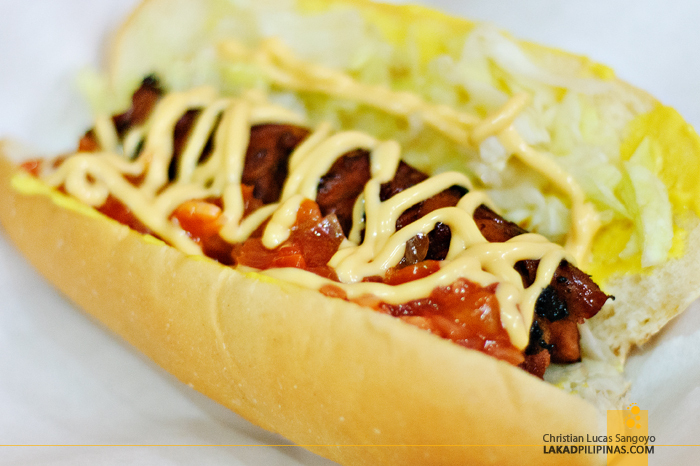 For sandwiches, we ordered the Papa Rock’s Classic (PHP85.00), the Jaw Breaker (PHP150.00) and their Grilled Deli Sausage (PHP60.00). The burgers are stuffed with 1/3 pound patties, lettuce, tomatoes, cucumber, and cheese. Upon delivery, the only difference I saw between the Classic and the Jaw Breaker were the patties—the latter having two huge ones. While both are excellent—like Army Navy excellent—not surprisingly, the Jaw Breaker fared better with the group. 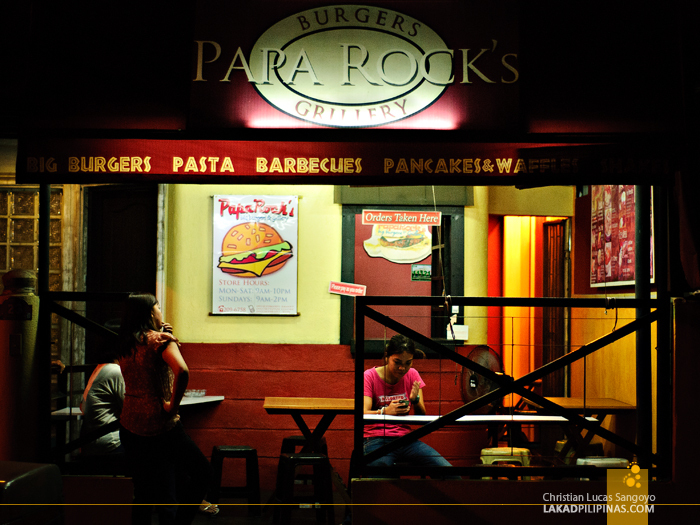 I was told that they make their own patties here at Papa Rock’s. Not to be outdone is Papa Rock’s flame-grilled Hungarian Sausage. Topped with special dressings and fresh cheesy salsa, I actually found it better than the burgers. But that’s just me; I’m crazy for Hungarian sausages. 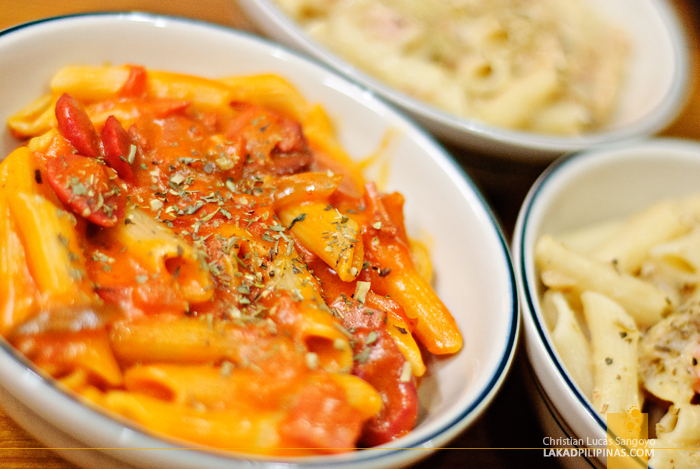 Next on our table were Papa Rock’s pastas. Three bowls were laid before us: Carbonara (PHP60.00), Seafood Special (PHP60.00) and Mac n’ Cheese (PHP60.00) with each one using penne as pasta. I tried a few forkfuls of their Seafood Special, which has a mix of crabmeat and shrimps, but didn’t like it that much. The Carbonara and the Mac n’ Cheese—which doesn’t resemble the usual mac n’ cheese I’m used to—were the clear winners here for me. Which of the two’s better? I cannot choose. I suggest you order them both. 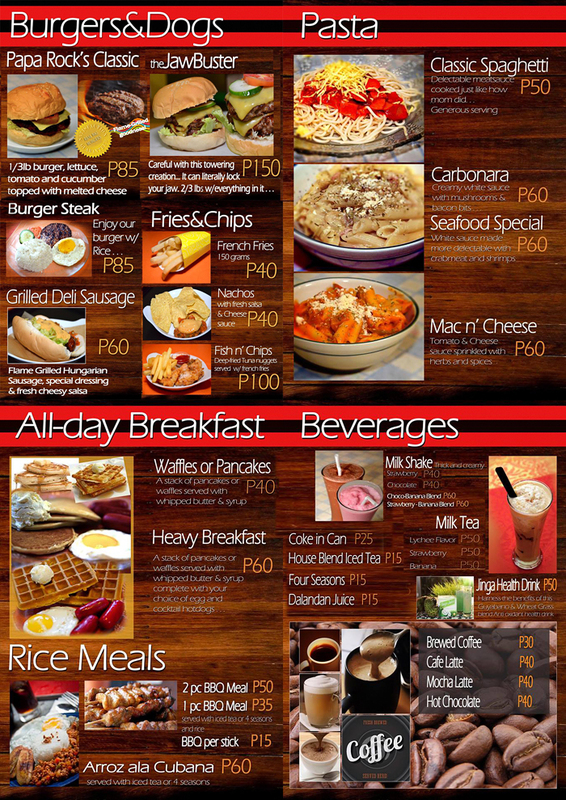 For drinks, Papa Rock’s offers coffee, hot chocolates, teas, and shakes. We went for their Milk Shakes (PHP40.00). Served in tall glasses, they only have it in two flavors, strawberries, and chocolates. I chose the latter. 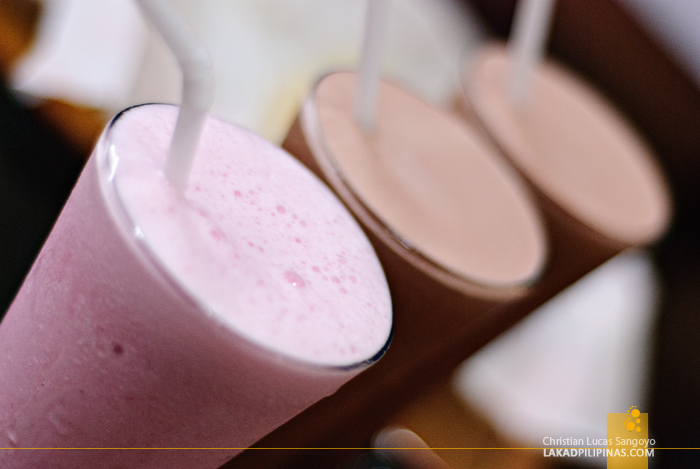 I’m no expert when it comes to milkshakes, but I like this one. Well, to a certain degree. Taking a sip felt very sinful; it’s as thick as it probably gets, although to be fair, its sweetness level is set just about right. 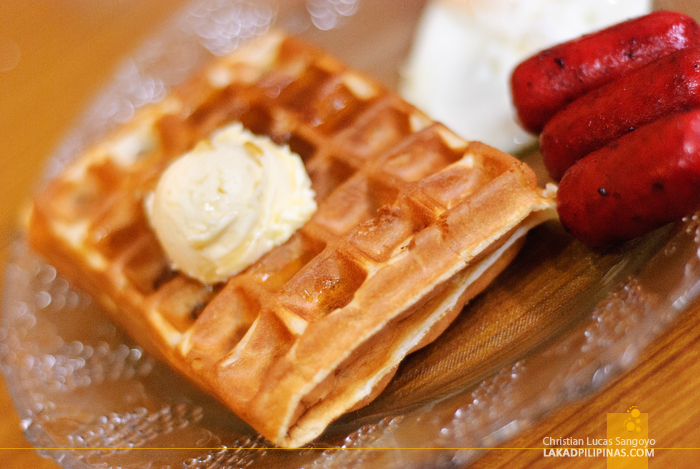 Last on our table were the Waffles and Pancakes with Eggs and Hotdogs (PHP60.00). Now I’m no big fan of waffles or pancakes, but the ones at Papa Rock’s were alright by me. It may be the combination of hotdogs with the cakes that made it. They can actually remove the egg and I’d still be happy. After going through all that, everyone was simply gut-bustingly full. We were five in the group and the bill clocked in at PHP740.00. That’s about PHP150 per person, quite cheap considering we each shared through two burgers, three pastas, two pancakes, and three shakes. Everyone agreed that the burgers were the biggest draw of Papa Rock’s (although I still feel that the sausage was better, hehe). Going all the way to Marikina City for dinner wasn’t so bad after all. But the final question is does Papa Rock’s really Rock? Indeed Papa Rock’s Rock. Galing! 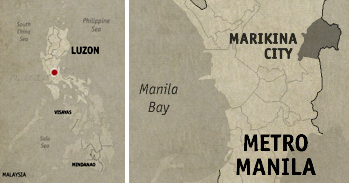 Masubukan nga dito. Hehehe! 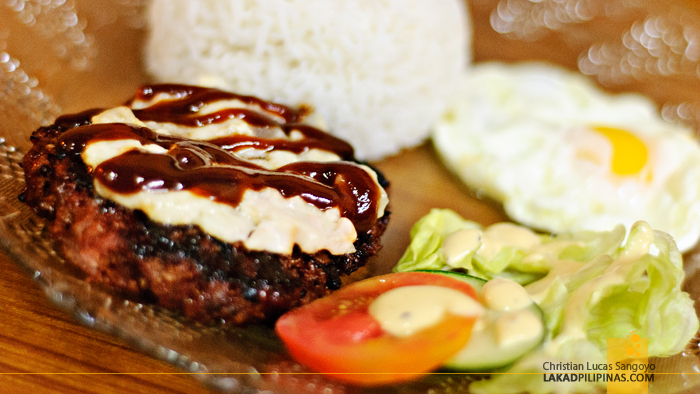 mukhang masarap yung burger. Nakakatakam, mukhang may gana na ako kumain ulet.